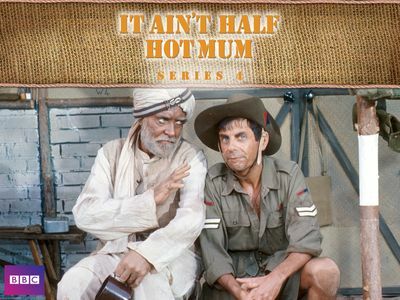 Here's where to watch every episode of It Ain't Half Hot Mum season 4. Mouseover or tap an episode to see where to stream it. Click or tap the play icon to stream it on the best available service. Monsoon Madness Nov 2, 1976 When the Sergeant-Major makes the Concert party perform fatigues to be ready for the arrival of the monsoon, Lofty goes mad and vows to kill the Sergeant-Major. Kidnapped In The Khyber Nov 9, 1976 When it becomes difficult for Colonel Reynolds to hide his affair with Mrs Waddilove-Evans, he decides it's best to accompany the concert party to a show on the North-West Frontier. A Fate Worse Than Death Nov 16, 1976 The members of the concert party try to find the kidnapped Mrs Waddilove-Evans. Ticket To Blighty Nov 23, 1976 Bombardier Beaumont tries different ways to get sent home. Lofty's Little Friend Nov 30, 1976 An elephant follows Lofty to the camp. Flight To Jawani Dec 7, 1976 Men from a remote RAF base get too excited when the concert party puts on a show. We Are Not Amused Dec 14, 1976 A pageant, written by Captain Ashwood, might offend the Indian assistant to the District Officer. Twenty-One Today Dec 21, 1976 Gunner Parkins turns twenty-one. Sergeant Major Williams wants to give him a present.